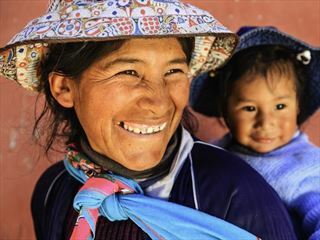 Hike the Inca Trail to Machu Picchu, explore the Amazon and sail across Lake Titicaca on our 14-day tour of Peru. 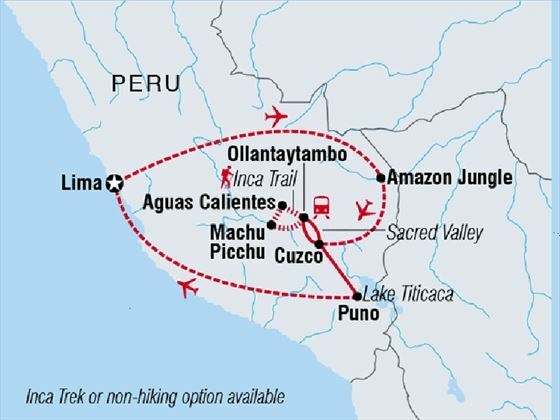 The trip starts in Lima and includes a two-day Amazon adventure followed by Cusco and a trek through the Sacred Valley to Machu Picchu. The tour ends with a boat trip across South America’s largest lake to meet the Uros people, who live on floating reed islands. Highlights include a four-day trek to Machu Picchu along the original Inca Trail, camping and visiting ruins along the way. You’ll also get the chance to spot rare wildlife such as toucans and caimans in the Amazon, sleeping in a rustic jungle lodge. Soak up the history in Cusco, take a guided tour of the modern capital Lima and enjoy the views over Lake Titicaca on a boat trip (INT - GGKIC). 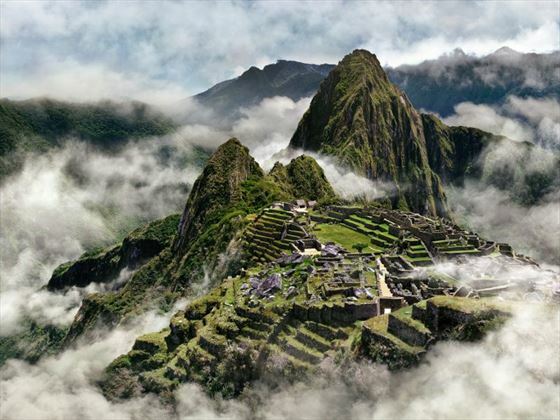 Visit one of the New Seven Wonders of the world, incredible Machu Picchu. Take a guided tour of Peru’s lively capital, Lima. Visit the Amazon Jungle to trek, take boat trips and search for exotic wildlife. Hike the original Inca Trail to Machu Picchu through the Sacred Valley. 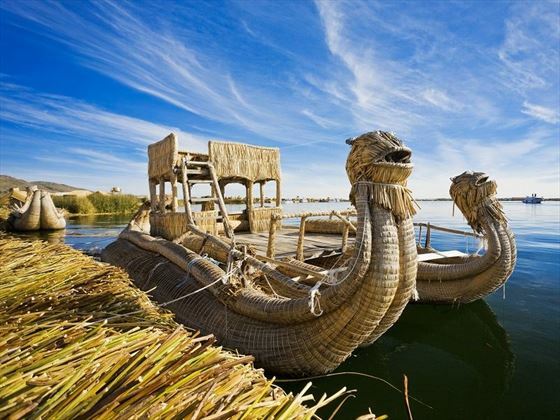 Take a trip to Lake Titicaca and visit the famous Uros floating islands. Explore the historic, cobbled streets of Cusco. Please note the minimum age of this trip is 15 years. Welcome to Peru’s bustling capital, Lima. You’ll be transferred to your hotel in Miraflores for a welcome meeting at 2pm, then head out for a half-day walking tour of downtown Lima. This includes a visit to the san Francisco Monastery, which holds around 70,000 human remains in its catacombs. Continue to the Central Market where you can peruse stalls. Taste street food snacks and take free time to wander the streets independently, visiting Plaza Mayor and its grand cathedral. The day starts with a flight to Puerto Maldonado for your two-day Amazon adventure. You’ll store the majority of your luggage at the tour office, taking just what you need for the trip. The journey to the Amazon lodge takes around 45 minutes by canoe, afterwards you can settle in before the orientation briefing. You’ll stay in one of two different lodges situated in the same part of the jungle. Rooms are basic and built with materials such as bamboo, with cold showers and flushing toilets, kerosene lamps and mosquito nets. There’s limited access to electricity and wifi in common areas, so relax and immerse yourself in the jungle. Take an early-morning boat ride along the river and trek through the rainforest. Along the way, you’ll stop at an oxbow lake where giant otters live and spot creatures like monkeys, macaws and caimans. Visit a parrot clay lick where birds come to feed on the salt to detoxify their fruity diet. After lunch, take another walk through the rainforest to learn about the fascinating jungle flora and how plants are used for medicine. Tonight, you can experience the jungle on a night walk where you’ll spot dozens of nocturnal bugs and spiders. 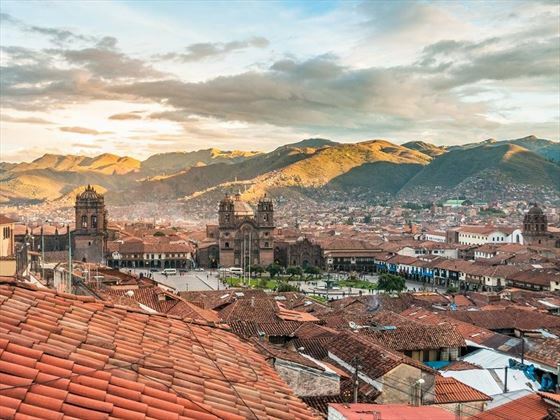 Start the day with a 35-minute flight to Cusco, one of Peru’s most historic cities. It’s important to take it easy and stay hydrated as you acclimatise to the 3,450-metre altitude. Take an orientation walk to see Cusco’s mix of Andean, Incan and Spanish architecture. Sights include Qoricancha Temple, the cathedral, San Pedro Market and San Blas Square. The tour ends with a trip to the Chocolate Museum, where you’ll get the chance to sample hot chocolate and buy locally-made souvenirs. Take a private bus to the Sacred Valley, known as Wilcamayo to the Incas. This fertile farming valley is littered with ruins, including Sacsayhuaman, which you’ll stop at for a guided visit. Head to a village to meet and have lunch with the residents, if you visit on Sunday, Tuesday or Thursday you’ll get to see the market. In the afternoon, continue on to Ollantaytambo, a pretty town surrounded by mountain peaks. Wander its Incan, grid-like streets and visit the archeological site, which is perched on a hillside overlooking town. Classic Inca Trail – this follows the original path that the Incas used to get to Machu Picchu. A minivan will take you to the 82-kilometre mark, where you’ll start the 45-kilometre, four-day trek. Today you’ll pass the ruins of Llactapata, which was burnt down by the final Inca Emperor to try and prevent Spanish forces from continuing along the trail. 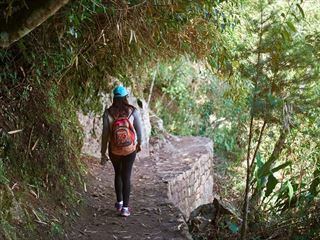 Inca Quarry Trail – this 26-kilometre trek starts from Choquequilla, a ceremonial Inca site used to worship the moon. You’ll walk through the tiny village of Socma and catch sweeping views from the stunning Perolniyoc lookout. Today you’ll also visit the Q’orimarca archeological site which the Incas used as a checkpoint. Both trek options are suitable for reasonably fit people but you may experience altitude sickness. Days usually start at 7am and finish at 5pm, all gear will be carried by porters and your meals will be prepared by the camp cooks. On the Inca Trail, you’ll camp for three nights, whereas you’ll spend the third night at a hotel on the Quarry Trail. Tents are twin-share and you’ll be given foam camping mats. Whichever option you choose, you’ll leave the bulk of your luggage safely at the hotel in Cusco. Hikers will be given a small duffle bag, with a five-kilogram limit, to pack for the trip to Machu Picchu. If you’re hiking, a team of porters will carry your bag while you trek. Breakfast included, lunch and dinner also provided for trekkers. Classic Inca Trail – embark on the most challenging day of the trek on a steep path for five hours to Warmiwanusca, also known as Dead Woman’s Pass. This is the highest point of the trail at 4,200 metres and a great place to get aerial views of the valley. After this, you’ll start descending into the Pacaymayo Valley where you’ll spend the night. 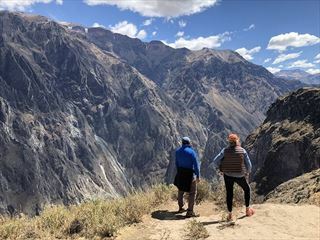 Inca Quarry Trail – this is also the most difficult day, starting with a three-hour trek to the 4,370-metre-high Puccaqasa pass for views of the Sacred Valley. In the afternoon, you’ll hike to Kuychicassa, the highest point of the trek at 4,450 metres, before descending to the Sun Gate for views of the Nevado Veronica mountain. Train – spend your extra time in Cusco exploring the city’s restaurants and sights. Visit the cathedral, do a chocolate-making workshop or visit one of the 16 sites included in your tourist ticket, including nearby Pukapukara and Tombomachay. Breakfast included, plus lunch and dinner for trekkers. Classic Inca Trail – climb through the Pacaymayo Valley for views of the snow-capped Cordillera Vilcabamba. Then you’ll head downhill to explore the ruins of Sayacmarca before tackling the third pass to Phuyupatamarca ruins, known as the town above the clouds. The day ends with a two-hour descent down Inca steps to camp. Inca Quarry Trail – journey downhill, passing the Kachiqata quarry, where the Inca’s were intercepted by Spanish forces. The trek ends at lunchtime when you reach Ollantaytambo where you’ll spend some time exploring before taking the train to Aguas Calientes. Spend the afternoon soaking in the town’s natural hot springs. Train – take the train to Aguas Calientes, which winds through the canyon-like scenery in the Sacred Valley. Spend the afternoon at the hot springs and relax before your trip to Machu Picchu tomorrow. Classic Inca Trail – have breakfast at 4am and then hike to the Sun Gate, which takes about two-and-a-half hours, for spectacular views of Machu Picchu. Meet up with the rest of your group for the guided tour around the ruins. Quarry Trail and train option – take a bus at 5.30am from Aguas Calientes, which takes about half an hour to reach Machu Picchu. Enjoy views from the Sun Gate and a tour around the ruins. Your guide will explain the history of the site, which was built around 1440 AD for Incan nobility. Explore the ruins of temples, living quarters and palaces and take some time to wander independently before you return to Cusco. Spend a free day in Cusco. Do some shopping, hang out in the Plaza de Armas, or if you’re looking for more action, take a hiking, biking or rafting day trip. Say goodbye to Cusco and make the seven-hour journey to Puno. The town sits on the shores of Lake Titicaca, which lies 3,810 metres above sea level making it the world’s highest navigable lake. 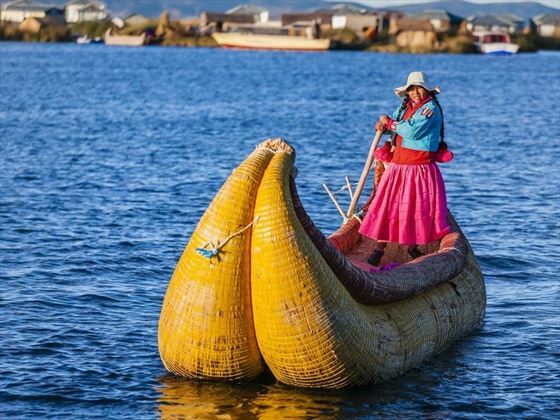 Puno boasts a blend of traditional Andean, Aymara and Quechuan Indian culture and is the jumping off point for floating island tours. Rise early for a boat trip across Titicaca to visit the floating islands. Made from tough reeds, these islets are occupied by the Uros people, who originated from the Amazon and built their homes on the lake to avoid hostility from Bolivian locals. Sail onwards to UNESCO-recognised Taquile Island, famous for its traditional way of life and world-renowned handicrafts. Take in sweeping views of the lake on an hour-long hike and have a traditional lunch featuring quinoa soup and mint tea. Fly from Puno to Lima this morning and if there’s time, you can opt for a trip to nearby Sillustani archaeological site. Here, you can see the remains of funeral towers built by a pre-Incan civilisation for noble men. Accommodation: eight nights in a hotel, three nights camping and two nights in a jungle lodge. Food: 13 breakfasts, six lunches and five dinners. 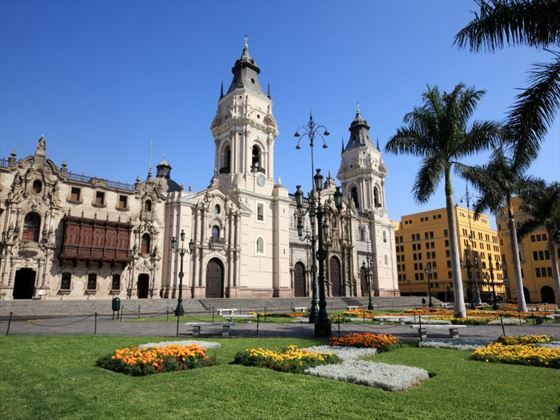 Activities: guided tour in Lima, including San Francisco Monastery and Catacombs. Cusco orientation walk, Full Boleto Turistico Pass with access to 16 archaeological sites in and around Cusco with no transport or guides included. Cusco chocolate museum and hot chocolate and Sacred Valley community visit and lunch. Inca Trail permits must be booked early to guarantee a space. If Inca Trail permits are unavailable by the time you book, you can opt to hike the Inca Quarry Trail instead. Should you choose not to hike at all, please let us know at the time of booking so alternative arrangements can be made.